It's our birthday! In which we answer some listener questions, give out some presents, and go on some hopefully hilarious rants. As usual, you can find the patreon at patreon/highlandercast, the facebook group at facebook/highlandercast, or talk to us on twitter @highlandercast. Vance is @vanciannotions. The discord is at https://discord.gg/N3z72r2. So this episode is about the aggro archetype, in case the episode name wasn't clear :) In this one, Vance and Sarv are joined by Wanchin Lee, from melbourne, to discuss how to build and play aggro decks in 7 point highlander. We talk a reasonable amount about Zoo and Wanchin Burn specifically, but also a number of other decks and ideas you can apply more generally. As usual, you can find the patreon at patreon/highlandercast, the facebook group at facebook/highlandercast, or talk to us on twitter @highlandercast. Vance is @vanciannotions and Wanchin is @leewc. The discord is at https://discord.gg/N3z72r2. It's another special guest, and this one is special indeed - it's Isaac, telling us the history of highlander in his own unique way :) If you're looking for Isaac, the best place is on facebook. The rest is as usual - you can find the patreon at patreon/highlandercast, the facebook group at facebook/highlandercast, or talk to us on twitter @highlandercast. Vance is @vanciannotions and Milly is @foxesforsale. The discord is at https://discord.gg/N3z72r2. Also, the next episode we're recording (but not the next you'll hear!) is for the 1 year mark for the 'cast - so if you've got questions about the format, or our history with it, there has never been a better time! Hello everyone! This is a tad late, but hopefully still enjoyable. Sarv and Vance are joined by Julian from melbourne, and talk some stats about the recent big events. As usual, you can find the patreon at patreon/highlandercast, the facebook group at facebook/highlandercast, or talk to us on twitter @highlandercast. Vance is @vanciannotions. The discord is at https://discord.gg/N3z72r2. So it's our first Millyless episode. It's also 90 minutes long. There may be some correlation. In this one, Sarv and Vance talk for quite some time about Cancon, about the three side events at the GP, and more than the occasional bit of getting side tracked. Vance also fires off the blasting cannons about an issue we could all do with thinking about around formats and gatekeeping, intentional and otherwise. The current version of dinobots is https://tappedout.net/mtg-decks/05-08-18-rg-walkers/, which is a couple of cards off what Vance played at the GP. As usual, As usual, you can find the patreon at patreon/highlandercast, the facebook group at facebook/highlandercast, or talk to us on twitter @highlandercast. Vance is @vanciannotions and Milly is @foxesforsale. The discord is at https://discord.gg/N3z72r2. This is the points update for Ravnica Allegiance. See you all at cancon and the GP! This episode is all about tempo! As usual, you can find the patreon at patreon/highlandercast, the facebook group at facebook/highlandercast, or talk to us on twitter @highlandercast. Vance is @vanciannotions and Milly is @foxesforsale. The discord is at https://discord.gg/N3z72r2. Also, if you're going to tell us that Vance confused mind bomb and psychic purge: we know. As usual, you can find the patreon at patreon/highlandercast, the facebook group at facebook/highlandercast, or talk to us on twitter @highlandercast. Vance is @vanciannotions and Milly is @foxesforsale. The discord is at https://discord.gg/N3z72r2. Hello all! In this episode, we talk about the Highlander at GP Melbourne, which was AWESOME. We recorded some vox pops on the day, but those aren't quite ready so I'll load them later in the week. As usual, you can find the patreon at patreon/highlandercast, the facebook group at facebook/highlandercast, or talk to us on twitter @highlandercast. Vance is @vanciannotions and Milly is @foxesforsale. The discord is at https://discord.gg/N3z72r2. The coverage of the event will be on youtube/cbrmtg when it is up. In this episode, we just talk for a while about decks we kind of want to play or that we think would be interesting or at least very funny. https://tappedout.net/mtg-decks/scrabble-3/ is one, and https://tappedout.net/mtg-decks/05-08-18-rg-walkers/ is another. Additionally, if you’re interested in Deck Techs for a handful of the archetypes we covered today, here they are: “Recycle”, a crazy combo deck for fans of Legacy Elves and Storm: https://www.youtube.com/watch?v=i5CGbTopqEk “RUG Life”, the heavy-hitting tempo deck of the format: https://www.youtube.com/watch?v=U7mcHMXjiJE “JP Storm”, a mainstay that Milly would love to sleeve up: https://www.youtube.com/watch?v=8aoHj2x_g8c … and if after this episode you’re still not quite sure what to sleeve up, feel free to peruse any of these awesome options for GP Melbourne, or for your local event: https://www.youtube.com/watch?v=JAN9TCydHjw&list=PLV8B_NP9C9gNLna3EoOaGq2-O04D5TMTB As usual, you can find the patreon at patreon/highlandercast, the facebook group at facebook/highlandercast, or talk to us on twitter @highlandercast. Vance is @vanciannotions and Milly is @foxesforsale. The discord is at https://discord.gg/N3z72r2. Welcome to another episode of spooky point highlander! In this episode, we talk about graveyards, with a focus on the more Halloween-y bits (Reanimator and zombies) with help from special guest Angus of CBRMTG, and a sad lack of Milly. As usual, you can find the patreon at patreon/highlandercast, the facebook group at facebook/highlandercast, or talk to us on twitter @highlandercast. Vance is @vanciannotions and Milly is @foxesforsale. The discord is at https://discord.gg/N3z72r2. Angus can be found on twitter as @dude_thisguy, and he and the rest of the CBR MTG crew can be found there as CBRMTG, on youtube.com/cbrmtg, and generally at highlander events being good people having fun times. The episode of 7 points in 7 minutes we mention on the show is available at https://www.youtube.com/watch?v=aHX94hYNAzM. Also guests are great, but they do add a lot of things to these notes. Good on you for sticking with us this far. In episode 15 (no, actually this time) we talk about preparing for big events. Hope to see you all at the GP! As usual, you can find the patreon at patreon/highlandercast, the facebook group at facebook/highlandercast, or talk to us on twitter @highlandercast. Vance is @vanciannotions and Milly is @foxesforsale. The discord is at https://discord.gg/N3z72r2. Or knight of briefing, if you will. In which the cast discuss Guilds of ravnica. This was filmed just before the whole set was released, so let me go ahead and say: Tajic is pretty damn good if you're in the market for hasty 3 drops in red and white. As usual, you can find the patreon at patreon/highlandercast, the facebook group at facebook/highlandercast, or talk to us on twitter @highlandercast. Vance is @vanciannotions and Milly is @foxesforsale. The discord is at https://discord.gg/N3z72r2. Welcome to the GRN points update! It's a short episode of only about 10 minutes. As usual, you can find the patreon at patreon/highlandercast, the facebook group at facebook/highlandercast, or talk to us on twitter @highlandercast. Vance is @vanciannotions and Milly is @foxesforsale. The discord is at https://discord.gg/N3z72r2. In this episode, we start the first in a series of episodes talking about the archetypes that you might encounter in highlander - how to play them, how to play against them, and what we mean when we talk about them. As usual, you can find the patreon at patreon/highlandercast, the facebook group at facebook/highlandercast, or talk to us on twitter @highlandercast. Anatoli is @twofootedgiant, Vance is @vanciannotions and Milly is @foxesforsale. The discord is at https://discord.gg/N3z72r2. In this episode, we interview the current National 7 point highlander champion, and former committee member, Anatoli Lightfoot. We talk about his history with the format, the sweet, sweet deck he played at nationals, and just highlander in general. His deck is at https://tappedout.net/mtg-decks/highlander-jeskai-tempo-2/ As usual, you can find the patreon at patreon/highlandercast, the facebook group at facebook/highlandercast, or talk to us on twitter @highlandercast. Anatoli is @twofootedgiant, Vance is @vanciannotions and Milly is @foxesforsale. The discord is at https://discord.gg/N3z72r2. And one of these days, Vance will save a copy of this rather than always typing it out. A listener asked us if tribal decks were viable in highlander, and it turned out that question has some fairly meaty answers. Listen along as we discuss it, and go through some of the good options, some of the not so good options, and one tribe in particular gets Milly fired up. Also, not actually in the podcast, nationals happens and Vance forgets to post the podcast for several days. 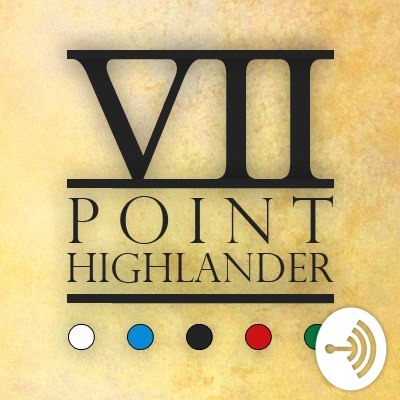 As usual, you can find us on twitter as @highlandercast, you can find us on pattern as patreon/highlandercast and on facebook at facebook/highlander cast. You might be starting to sense a theme. Decklists for the decks discussed will be added here as soon as the links are available. A (mostly) brand new set, another review! Plus, what's the point, listener questions and a new segment that we need your help to name. As usual, vance and milly can be found on twitter at @vanciannotions and @foxes for sale, the cast can be contacted at @highlander cast. Facebook is facebook.com/highlandercast. You can find the highlander discord at discord.gg/N3z72r2 Also, we're now on spotify (Finally! Hooray!) This is the re-upload, which we certainly hope actually populates out to all the places. It's the same as the other episode 8. A mini update where we talk about the points update that came out with the core 19 pre-release. In this episode, we talk about how to make a virtue out of your limited resources, and discuss a selection of decks that aren't super expensive, but are high quality and a lot of fun. You can find us on facebook at https://www.facebook.com/highlandercast/, and on twitter @highlandercast Vance is @vanciannotions on twitter, and Milly is @foxesforsale The decks sarv talks about can all be found on auseternal. http://www.auseternal.com/forums/topic/wr-combo-sneaky-jiki-budget/ http://www.auseternal.com/forums/topic/rg-combo-gruul-moon-budget/ http://www.auseternal.com/forums/topic/uw-tempo-turbo-clamp/ http://www.auseternal.com/forums/topic/b-control-call-of-dt-black-obs-budget/ The discord is at https://discord.gg/N3z72r2 , and Vance definitely didn't forget to add this link. In this mini-episode, we update the points list, talk about what's on the watch list, and change the committee membership.